Tangerine is the common name for a widely cultivated variety of mandarin orange (Citrus reticulata), whose easily-separated fruit is characterized by a rind with a deep orange, red, or orange-red color. The term also refers to the fruit of this citrus plant. The term tangerine and mandarin frequently are used interchangeable. 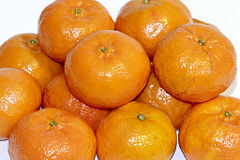 However, tangerine most properly is considered just a subgroup of the larger mandarin group, Citrus reticulara, with tangerines specific for those cultivars with deep orange-red fruit. The term tangerine originally was used in the nineteenth century to designate only this one type of mandarin, a Mediterranean type, with the word based on the city of Tangier (Katz and Weaver 2003). The marketing of specifically reddish-orange mandarin cultivars as tangerines is a culinary or popular term, not a botanical classification. Tangerines provide value for both humans and the ecosystem. Ecologically, the plant, including its leaves, fruit, and flowers, provides nourishment to various animals, including insect larva and pollinating bees. For humans, the fruit not only provides nourishment, but also aesthetic and sensual values, with beautiful flowers and the unique taste of the fruit. The fruit itself is quite nutritious, being a good source of various vitamins, especially vitamin C, as well as fiber and folic acid. Tangerines are a type of citrus plant. Citrus is a genus of flowering plants in the family Rutaceae (orange family) and a common name for edible fruits of this genus. Originating in tropical and subtropical southeast Asia, these plants are among the oldest fruit crops to be domesticated (Katz and Weaver 2003). Citrus fruits include oranges, lemons, limes, citrons, grapefruit, pomelos (pummelo, pommelo), and mandarins (tangerines). Mandarin oranges or mandarins, Citrus reticulata, of which some cultivars commonly are called tangerines. A citrus plant's distinctive fruit is a hesperidium, a distinctive berry with the internal fleshy parts divided into segments (typically ten to 16) and surrounded by a separable rind (Katz and Weaver 2003). The rind is leathery and the segments, or "liths," are filled with pulp vesicles. Citrus plants, which are small trees or large shrubs, have spiny shoots and alternately arranged evergreen leaves with an entire margin. The flowers are solitary or in small corymbs (a branched cluster of flowers with lower flowers having longer stems). Each flower is two to four centimeters in diameter, with five (rarely four) white petals and numerous stamens; they are often very strongly scented. Cultivated Citrus may be derived from as few as three or four ancestral species. Katz and Weaver (2003) claim that the generally accepted view is that there were three primordial Citrus species—Citrus medica (citrons), Citrus maxima (pumelos), and Citrus reticulata (mandarins)—and that all other types of citrus rose from single or sequential hybridization events between these species or their offspring. The hybridized types of citrus may or may not be recognized as species according to different taxonomies. Thus, anywhere from three to 170 species are recognized, with the commonly used system of Swingle recognizing 16 species (Katz and Weaver 2003). The mandarin is one of these species, and the tangerine is one variety of mandarin. Mandarin orange (or mandarin) is a small citrus tree with fruit resembling the orange, but is more oblate rather than spherical. Tangerines are small and erect trees, with fruit at the end of branches, and tend to be erect (Janick 2005). The tangerine fruit is smaller than most oranges, and the skin of some varieties tends to be loose and peels off more easily. The taste is often more sour, or tart, than that of an orange. Being loose-skinned, the fruit is hard to pick without damage and is the highest priced fruit (Janick 2005). The number of seeds in each segment (carpel) varies greatly (up to 59). Good quality tangerines will be firm to slightly hard, heavy for their size, and pebbly-skinned with no deep grooves, as well as reddish-orange in color. The tangerine can be grown in tropical and subtropical areas. The tree is more tolerant to drought than the fruit. The tree is easily damaged by cold; none are cold hardy (Janick 2005). Peak tangerine season is short, lasting from November to January in the Northern Hemisphere. A popular alternative to tangerines are clementines, which are also a variant of the mandarin orange. Tangerines usually are eaten out of hand, or in fruit salads, desserts, and main dishes. Tangerine flavor is used in bottled juice or gatorade soft drinks. In Florida, ten percent of tangerines can be added legally to frozen orange concentrated for color (Janick 2005). Tangerines are a good source of vitamin C, folate, and beta-carotene. They also contain some potassium, magnesium, and vitamins B1, B2 and B3. A medium-sized tangerine (70 grams, weighed without the peel) provides 1.5 grams of dietary fiber and supplies 25kcal (Bender and Bender 2005). Some recognize four main horticultural groups of tangerines (Janick 2005). Satsuma. Common in Japan, these are seedless and sections are exported. These are often called mandarins. Hybrids such as "King" and "Temple" orange. Large and good quality that are easy to peel. One of the oldest and historically most popular varieties was the Dancy tangerine, but it is no longer widely grown (Jackson and Futch 2003). This variety originated in 1867 from a seed of Moragne tangerine (Jackson and Futch 2003). The Dancy was known as the "zipper-skin" tangerine, and also as the "kid-glove orange," for its loose, pliable peel. Its peak season is December, so children would often receive one in their Christmas stockings. Over the years, this variety was replaced by such hybrids as Robinson, Sunburst, and Honey (Murcott). The Honey tangerine, originally called a murcott, is very sweet, as its name suggests. Other popular kinds include the Sunburst and Fairchild tangerines. Katz, S. H., and W. W. Weaver. 2003. Encyclopedia of Food and Culture. New York: Schribner. ISBN 0684805685. This page was last modified on 5 July 2008, at 16:17.